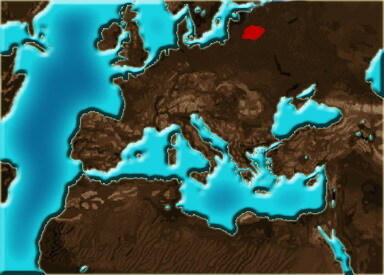 By around 2000 b.C., the Baltic people (or Balts) established in the proximities of the Baltic Sea and there upon lived immune to external influences for centuries, protected by a wall of lakes and swamps.Among the Balts, the Lithuanians distinguished themselves by their ferociousness in the arts of war and rapidly established control over a significant part of the region. The oldest text mentioning the Lithuanians dates to 1009 A.D., and it was written by Saint Bruno, the man in charge of exploring the region on the orders of King Boleslaw I of Poland. This is clear evidence that this kingdom not too far away, has some interests potentially threatening to the sovereignty of the Balts.The Lithuanians come into the 12th century threatened at various fronts. To the east there are the Rus' of Kiev and Novgorod, who appear to want something more from the Lithuanians than just mere commercial routes. To the south, the catholic kingdoms seem to want to expand their faith in lands where ancestral pagan rituals are practiced by the population. From the west there are rumours of a kingdom of Denmark who wishes to build an empire in the North of Europe.The time is at hand to unify the various Baltic tribes under one leadership, even if brotherly blood needs to be spilled. Only a unified people can face the ever-growing external threats.